Anyone who follows Cincinnati sports knows there’s no love lost between Cincinnati and Pittsburgh. 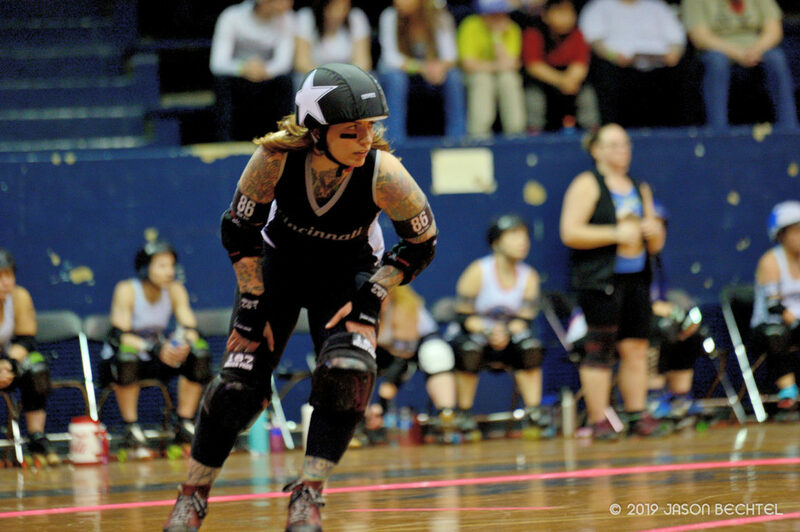 And when the Cincinnati Rollergirls defend Schmidt Memorial Fieldhouse against Steel City Roller Derby on Superhero Night this Saturday, April 6, fans can expect a fiercely competitive matchup. But in a sport whose players pride themselves on leaving it on all the track and celebrating together after each game, don’t expect any of the animosity between the athletes that marks certain other Cincinnati sports rivalries. Despite their relatively close proximity in the region and in the rankings, CRG and Steel City have played each other only a handful of times in their bouting histories. In their four meetings between 2008 and 2011, each team took the win twice, and the biggest point spread was just 32 points. Could the outcome be similar when the teams meet again on Saturday at Schmidt Memorial Fieldhouse at Xavier University? All signs point to yes. CRG and Steel City are neck and neck at No. 88 and No. 89 in the Women’s Flat Track Derby Association’s official rankings, after Steel City jumped 14 spots in the last ranking period. Flat Track Stats, which uses its own computerized ranking system, also predicts that the game will be a close one, giving the 1-3 Black Sheep a 56% chance of defeating the 2-2 Steel Hurtin’. CRG is fielding the same Black Sheep roster as it did last month (why mess with a winning formula?) while the Steel Hurtin’ roster is anchored by veteran skaters including Ally McKill, Dakota Slamming and Stark Raven. In the B-team game, CRG’s Violent Lambs will be looking for their second win of the season after beating Brandywine’s B team last month, and the 0-2 Steel Beamers will be looking for their first. The Lambs roster also looks much the same as last month, but with one new skater, Big Red, making her Lambs debut. Which team will emerge victorious on Saturday and come out on top of the series? There’s only one way to find out. When: Doors open at 5 p.m. CRG’s Black Sheep play the Steel Hurtin’ at 6 p.m. and CRG’s Violent Lambs play the Steel Beamers at approximately 8 p.m.
Entertainment: Meet costumed characters from A Characteristic Attitude, enter our superhero costume contest at halftime of the first game for a chance to win CRG swag and enjoy a superpowered performance by Dance Flash Fusion right after the Black Sheep game. Tickets: Discounted presale tickets are available through Brown Paper Tickets. Tickets will also be available at the door.